As cliché as it sounds, this light and lovely recipe was born out of the CSA box. 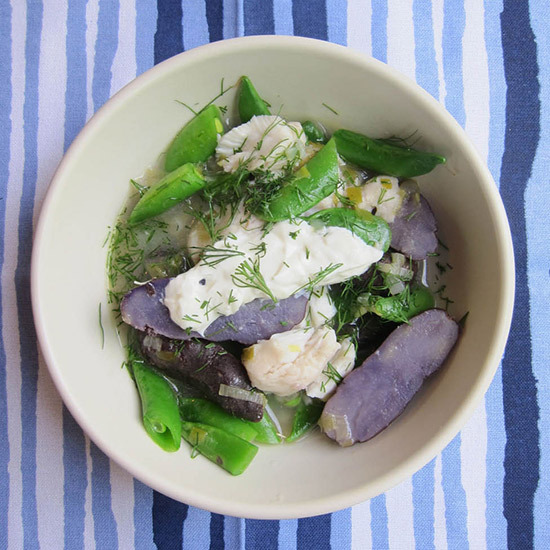 I was faced with snap peas, spring onions, dill, blue potatoes and fresh horseradish—all ingredients that are lovely with fish. I just brought them together with some wine and a dollop of sour cream. Cool-climate Sauvignon Blanc’s minerality and herbal notes are almost always a great match for fish and they’re especially nice with dill and snap peas. I opted for a Sancerre from France’s Loire Valley. 1. In a medium pot, cover the potatoes with water and bring to a boil. Simmer over moderately high heat until just tender, about 10 minutes. 2. Meanwhile, in a bowl, mix the sour cream with the 1 tablespoon of dill and the horseradish. 3. In a deep skillet, heat the olive oil. Add the scallions and cook until softened, about 2 minutes. Add the wine, bring to a boil and cook until nearly evaporated, about 3 minutes. Add the water and bring to a boil. Reduce the heat to moderately low and add the fish. Simmer gently until nearly cooked through, about 4 minutes. Gently stir in the snap peas and cook until bright green, about 1 minute. 4. Transfer the stew to bowls and top with the horseradish cream and extra dill, then serve. One serving 404 cal, 16.5 gm fat, 2.8 gm sat fat, 21.6 carb, 2.8 gm fiber, 38.1 protein.